Bloom sold the franchise during the summer of 1975 to Frank Goldberg, a former co-owner of the successful Denver Nuggets franchise. Goldberg started anew, renaming the team the San Diego Sails for 1975 – 1976. Goldberg hired former University of Minnesota coach Bill Musselman and, with a completely different roster, color scheme, set of uniforms and just about everything else, sought to repeat Denver’s turnaround a season earlier from mediocrity to championship contender. But the Sails attracted only 3,060 fans to their home opener on October 24, 1975 – a loss to the Nuggets – and fan attendance rapidly dwindled further as the team limped to a 3-8 start. (A “crowd” of 1,670 showed up for San Diego’s third and last home game, against the San Antonio Spurs.) Goldberg soon learned San Diego was to be shut out of the pending ABA-NBA merger. Reportedly, the Sails were shut out at the insistence of Lakers owner Jack Kent Cooke, who refused to share his Southern California fan base with a team to the south. After the Sails’ demise, the club’s roster was put out to auction among the ABA’s eight remaining clubs. Guard Bo Lamar, and big men Mark Olberding and Dave Robisch were the only Sails players to receive bids. The exception was the team’s best player, All-Star center Caldwell Jones. ABA Commissioner Dave DeBusschere held Jones out of the auction as a “special case”. His contract was sold to the Kentucky Colonels in a separate transaction shortly thereafter. The ABA’s troubled 1975 – 1976 season ground on. 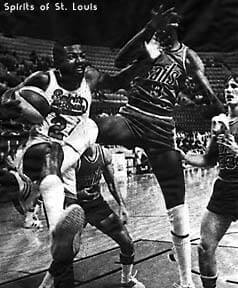 The Utah Stars folded three weeks after the Sails on December 2, 1975 – the third ABA franchise to fold since the opening of training camp in October. The league folded in the spring of 1976, after four of the surviving seven teams were admitted via merger into the NBA. 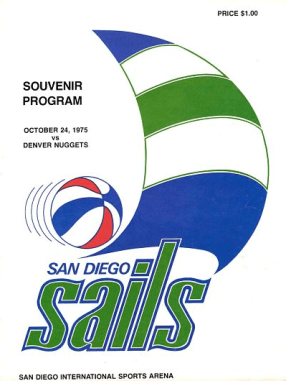 The San Diego Sails were an American Basketball Association team based in San Diego. Bloom sold the franchise during the summer of 1975 to Frank Goldberg, a former co-owner of the successful Denver Nuggets franchise. Goldberg started anew, renaming the team the San Diego Sails for 1975 - 1976. Goldberg hired former University of Minnesota coach Bill Musselman and, with a completely different roster, color scheme, set of uniforms and just about everything else, sought to repeat Denver's turnaround a season earlier from mediocrity to championship contender. Sails – The name is due to all the sail boats located in the San Diego Harbor. Who is the greatest San Diego Sails?